ABOUT THE DESIGN GUIDELINES Design guidelines answer the question of “how” we achieve the benchmarks in the ITCN indicators from guide two. The guidelines herein are conceived as a supplement to other urban design guideline packages that already exist for the Indian context. This document looks at key features of pedestrian-oriented public space, and offers pointed insights about what ITCs needs from those features. •	llluminate the interrelationships of these elements placed the neighbourhood, giving users greater depth of insight. Installing a bench in the public realm can be a positive expenditure. But when that bench is carefully coupled with quality shading, and is designed with an extra wide and flat surface for a baby to crawl on, the generic bench becomes specific, and a piece within the public realm that supports early childhood development outcomes. The ITCN emerges when a critical mass of those pieces is achieved. The following ITCN design guidelines are organized so that they can be read as a supplement to other established streets guides. ITCs need to be considered at every step of the planning process. These guidelines offer focus on what is pertinent to ITCs within current best-practice walkability and pedestrian-oriented urban design. •	Define physical components and approaches that specifically improve the quality of the public realm for ITCs. •	Communicate the means by which objectives are achieved, as well as make a clear connection to the evaluation and monitoring methodology. Percentage of government schools out of total SCHOOLS Extending the use of frequently visited destina- USAGE OF PERCENTAGE OF GOVERNMENT THAT ALLOW number of government schools that allow multi tions for ITCs such as government school camusage of school campuses during non-school puses to the wider community can provide extra SCHOOL CAMPUSES DURING NON-SCHOOL HOURS hours opportunities, space and accessibility for time spent outdoors. Desk based estimation e.g. based on earlier survey & with systematic on-site verification. These guidelines are organized by the five elements of a neighbourhood covered in the Framework, giving the reader an easy-to-navigate list covering the breadth of the public realm. •	Neighbourhood Layout: covers the larger scale organisational factors, such as the overall character, the density, distance and mix of facilities with the area •	Streets: are mainly mobility-related spaces concerning the practicalities of moving comfortably in the public realm between stops. •	Parks and Open Spaces: cover one of the key green destinations that matter to ITCs. •	Social Infrastructure: cover local amenities and community facilities. •	Urban Services: cover water, electricity, waste, drainage and other environmental factors Streets and Destinations share a list of components that can be applied to both, i.e. benches and shade elements. Design guidelines show interventions through which an ITCN can reach thriving status. HOW DOES ONE DECIDE WHICH COMPONENT TO USE? Understanding ITCN objectives and the service level benchmarks of the ITCN indicators will give city managers a clear way forward in addressing the shortcomings of their resepective neighbourhoods. Still, interventions need to be planned wisely. Infrastructure becomes developmentally supportive in the right combination with other elements. More people will use a great bench. A bad bench will usually be empty. Most cases of recent success in the Indian urban context has come from collaborations between urban design firms and ULBs. (See JM Road Pune et al.) A well-selected design professional will possess sensitivity in materiality and thinking through the complexities of combining elements. But itâ&#x20AC;&#x2122;s worth reiterating here for both eventual clients and contractors who may use this guide, that not all benches are created equal! The elements included here for guidance work best for ITC support when they are used in combination. It is when a bench is well located and is installed in combination with other key ITC factors, like good shade and even and clear lighting, where the bench is transformed from a neutral piece of equipment into something that is actively contributing toward early childhood development goals. Crossing - include bollards, paint extra colour into the crossing, include solar lighting, and think about a cistern for rainwater catchment. For example, Next time you are thinking about a new public property such as: Fence - add a sittable surface, plant vines at its base for shade, and include solar lighting. ITCs Use the Public Realm in Specific Ways that Design Needs to Respond to ITCs use the public realm in specific ways. This bench offers a clear example of what an ITC needs from a place to sit. It is low, keeping any potential falls short. It is very wide and totally flat which would allow a mother to lay a baby on its back or to lay a baby carrier flat next to her instead of on the ground. And it provides a back to lean against which makes a huge difference in comfort for longer stays — say, in the case that there is an older sibling playing nearby. In combination with other key elements like a sense of quiet, trees and shrubs, and benches in the right number and with plenty of variation, seating systems can become rich spaces of wonder and learning for ITCs. DECISION MAKING STORIES New projects in the ITCN will have competing points of view on what to do, where to do it, and when it should happen. The ‘statue effect’ describes the tendency to push for high-profile projects that are attention grabbing, but which have minimal positive effects on the wellbeing of residents. The statue effect can be counteracted by fair use of data, to enter into and drive a dialogue about ITC interventions. Data can focus discussion by delimiting the possibilities of what can be proposed. As well as offer stakeholders a common language. Examples of unfocused stakeholder viewpoints in the absence of data are below. Stakeholder’s frequent first impulse is to think personally and to say ‘no.’ Data can help to ground dialogue in the realm of what is possible; rallying residents around positive outcomes, not threats. ITCN Indicators and Objectives A statue of a mother and child in a park, more parking, or the fear of lost business, wouldn’t clearly satisfy any of the ITCN objectives nor indicators. These tools can be a useful first filter for any ideas of expenditures. Use data to anchor and orient conversations about what to build. These data can be useful entry points. Through balancing data with ITC objectives, solutions may emerge that no resident nor local politician previously knew that they “wanted” or “needed”—or was even possible for that matter—but which offers the field of stakeholders a common cause that can be rallied around. Consult of ITCN objectives and the benefits of “Connection to Nature” and informal play for ITCs. In addition to deciding what to build, using data to establish where new interventions should get implemented will add complexity to the dialogue. Data ensure the evenness of benefits to ITCs from new projects. Though a new park will be well liked, its benefits will be undermined if people cannot comfortably walk to it. Indeed it may make sense to invest in basic upgrades to the neighbourhood park, and to simultaneously allocate for improvements to the streets immediately surrounding it. FINDINGS OF BASELINE SURVEY: INVESTMENT OCCURRED IN A SINGLE BLOCK, BUT NOT THE SURROUNDING STREETS. Consult of ITCN objectives for the benefits that come from safe, healthy, and interconnected streets. Co-creation, public space coalitions and self-organisation •	Creatively involving the community in decision making and the planning and design process will make spaces more relevant and usable by responding to demand, prompting buy-in and bolstering civic pride. •	Integrate co-creation and engagement into the community’s existing gatherings and places where they spend time, rather than organising events to new places that they need to visit •	Create incentives for sense of ownership and care of public space by the community and the consideration of spaces as something truly for the public. •	Community involvement in management and operation, directly or indirectly. •	Cross-sectoral approaches including between parks and recreation, health, culture, transport, urban development, sport and leisure. Place management •	Visibly active maintenance program that comforts and encourages ITCs to spend time in public spaces and explore, especially women and girls. •	Progressive policies that address adults’ misconception of play, the risks for children in public space and support creative ideas to provide safe spaces for young children. •	Inclusive policies for activities important for ITCs such as breastfeeding, toilets with diaper changing areas and drinking water. •	Maintenance, cleaning, waste and water management, lighting that can adapt to different uses and seasons. This park possesses some good features including safety from the street, sound protection, and a good amount of open space for kids to run. However, they can never use it because it is always occupied by large groups of men. Even without changing the rules of usage, programming day- or weekend-long events in the park will re-define the sense of ownership for ITCs to feel comfortable and welcome there. Quick wins experiment •	Demarcate new approaches and catalyse improvements with pilots and trials, e.g. play streets / happy streets (street closures to traffic) or ‘building parties’ - where the community are involved in cleaning streets, planting trees or painting facades as spaces change. Children can be the most active members of such events. •	Build trust and encourage buy-in from building owners/occupiers, decisionmakers and the community. •	Must be combined with a long-term strategy for evaluation, scalability and replicability. Costs and benefits •	Understanding underlying financial patterns and the actors influencing public space such as managers, building owners, occupiers and developers. •	Allocation of funds for maintenance and social components such as placemaking. M. G. Road, Gangtok, Sikkim © Navanil C.
Consider setting up a Child Priority Zone: BVLF Urban Starter Kit page 78 talks about the concept of setting up a Children’s Priority Zone, which is focused around the main amenities frequented by children. It is worth looking this up to see if it can apply to your neighbourhood. The first steps involve signage about the Children’s Priority Zone, messages about the importance of early years, behavioural prompts to trigger interactions between caregivers and young children, or temporary activities such as pop-up play and play streets. It also involves finding ambassadors in the community who will promote the zone in day-to-day life. from those of children in general as they are always with caregivers, their range of mobility is shorter, and their bodies and brains are more vulnerable. 10 minutes in all weathers. Note: We estimate that 3-5 y/o moves slower than a 2-3 y/o because they are more confident in the public realm to be curious. * Total Area of the Neighbourhood is 60 Ha Approx. and the total population is 15,000 people. The recommendations mentioned here are based on the existing space standards suggested by URDPFI and Urban Greening Guidelines. The existing norms have been modified keeping in view the reduced speed of movement and comfortable outdoor time relevant for Indian climate. The recommendations are not mandatory and should be understood with respect to ITC specific needs only. Recommended: Placed at walking distance of max.10 minutes or 300m. Recommended: 50-125sqm. Covering a total area of 750sqm. Infants and caregivers : 0-2 yrs. Housing Area Park Toddlers with caregivers: 2-3 yrs. We suggest that totlots as small as 50sqm can also be developed specially in denser areas as 125sqm may not be possible to acheive in all cases. This will incresae the spread and ITC reached across the neighbourhood. The number of Housing Area Parks is suggested to be increased for better reach. The existing norms suggest 1 Neighbourhood Park of 10,000sqm. We suggest the area coverage should increase from 10,000 to 18,000sqm. (as per Dutch standards Min. 300 sqm/Ha is provided for a Neighbourhood Park i.e. 18,000sqm). Also the area should be broken into 3-4 Nos. of parks for better distribution and ITC reached. The range provided in URDPFI is a gross figure of open space and therefore not relevant for ITCs. The NBC stadard of 3sqm is a baseline standard. A range of 3-4 sqm is suggested in an attempt to better the existing norm. To be located near a housing area park or a neighbourhood park. d In denser areas school space should be used as tot-lots after school hours. Playfield area with a minimum of 18m x 36m to be ensured for effective play d and open during non-school hours for ITC use. Indicators 14. Presence of walk zone/footpath/sidewalk at significant routes in the neighbourhood. 15. Provision and quantity of public seating to stop and rest, by neighbourhood 16. % of clear and unobstructed pedestrian footpath of total road length. 17. Presence of kerb cuts. 18. % of streets with adequate lighting. 19. Streetlight spacing in the neighbourhood. 20. Presence of cycle routes inside the neighbourhood and on major bordering roads (km would be a future indicator). 21. Encroachment on NMT roads at neighbourhood level by Vehicle Parking (%) 22. Presence of traffic calming measures in the neighbourhood and average speed of vehicles in the neighbourhood 23. % of intersections containing timed signals and lighting in the neighbourhood and along its border roads. 24. % of one-way streets in a neighbourhood. 25. % of total street length closed to 4-wheel traffic. 26. % of total street length closed to 4-wheel and 2-wheel traffic. 27. Presence of informal wayfinding in the vicinity of schools and parks. 28. Instances of observable standing water, overflowing drains, sewage. 29. Presence of green corridors on major routes and number of corridors in a neighbourhood. 30. % of streets with decibel levels above standard 55 dB inside the neighbourhood. 31. Presence of no-honking zones in the neighbourhood. 32. Fatality rate for pedestrian and NMT (%) 33. The number of fatal accidents occuring due to traffic in the neighbourhood. Click here to watch “Walking with Amadou”, 10 short clips of a toddler moving through Dakar, Senegal. LIMIT, LINK AND SHARE STREETS - 3 STEP APPROACH Streets are a vital part of our cities and facilitate a range of uses, from vehicular transport to pedestrian movement. But the different users of streets can have conflicting needs. These conflicts have at times been resolved by completely banning cars from certain streets in the city. Not every city or neighbourhood is ready for such a big step. LIMIT - TRAFFIC CALMING TO ALLOW MORE CHILDREN ON ROADS As identified in the Framework, Indian neighbourhoods are car-centric. (Framework, Page 15). One of the critical challenges is the unsafe nature of the street, which allows through-way traffic, limiting the child’s independent mobility. The first step to take in your neighbourhood is to reduce car dominance by: •	Preventing unnecessary traffic movement: Prohibiting vehicular traffic completely from streets wherever possible to give pedestrians and ITC’s priority and more space to move freely, without fear of traffic. Access for emergency vehicles should be permitted if there is a calamity. •	Set Speed Limits: Globally, many neighbourhoods have set and imposed speed limits of 15-30 km/hr in local streets. Research has shown that children are unable to gauge the speed of vehicles travelling faster than 32km/h, and may believe it is safe to cross when it is not. It is important to enforce this limit as well. 6 •	Calm one-way traffic movement : Neighbourhood streets with ITC activity need a clear obstacle-free pedestrian space. This arrangement in access streets will be possible with narrow carriageways. Figure 3.5: The illustrations show the distance required by speeding cars to stop. The probability of fatality due to cars driving at 60kmph is roughly five times higher than cars driving at 30kmph. However, the limitations included: •	Children do not always use the Kindlint, only if it aligned with where they were already going. •	It did not link to some key destinations within the neighbourhood •	Not everybody understood the intention of the tiles.10 Subsequent examples of Kindlint have been more successful in other cities. Therefore, before setting up a child priority route in your neighbourhood, make sure that •	the needs of the residents are considered, •	many of the key destinations and •	frequented walking routes are identified and connected; and •	the route is made as clear and legible as possible. Keep the following in mind when designing shared streets: •	Choose a material that is associated with pavements for the shared street. This encourages traffic to slow down and sends a clear signal that its a zone with pedestrian priority. •	Use planters or bollards that cars have to drive around to slow them down further. •	Keep the planters low, so that small children playing or walking behind the planters are visible to oncoming traffic. •	Place clear signs at the beginning of the shared street to indicate to vehicles that they are entering a shared street zone. •	Introduce a clear speed limit to the zone: 15kmph is a speed limit that is often. •	Monitor use through local traffic police by strictly fining the offenders. Shared Commercial Street in Gangtok, Sikkim ©Navanil C.
•	Encourage people to walk and cycle within their local area, and to nearby destinations; •	Improve the quality of the built environment. INTRODUCING SEGREGATION OF USES IN INDIAN NEIGHBOURHOOD STREETS Street widths in urban neighbourhoods in India predominantly range between 6-15m. Space is scarce in the dense urban fabric of Indian cities. Therefore it is critical to use the space available judiciously to accommodate the various and sometimes conflicting uses. PARKING STRATEGY Parking is one of the most recurring urban issues of Indian megacities. Most of the public space is taken over by unauthorized on-street parking. Addressing unauthorized parking in an ITC friendly neighbourhood is very critical to free up public space for pedestrians. Parking is also the most visually obstructing activity for infants at their eye level. Key considerations for parking in a neighbourhood can be: •	Parking management plan for the neghbourhood to be developed. •	Designated, paid or shared parking to be provided wherever possible in neighbourhoods; •	On-Street parking to be regulated •	No parking on 6m wide roads; •	One-side parking on 9 and 12m roads, in designated areas only; •	Two-side parking to be broken down by planted areas; •	Two-side parking streets to be either shared surfaces or one-way streets for calmer traffic. •	Two-way streets under 9m are not recommended. •	No parking at intersections. Prohibit on-street parking within 20 to 50ft of intersections. •	Queuing – Designing streets so that the moving cars must occasionally halt between parked cars before moving forward, which will help in successfully developing narrow streets while encouraging vehicles to move slower, and also allowing areas where a wide clear area is available for parking. •	The length of parking rows should be limited to 60m (20-23 contiguous spaces) to create breaks for landscaping and sidewalk play spaces. •	Kerbside motorcycle parking can be easily integrated with the parallel car parking space about the same width of 2.50m •	Bicycle parking can be placed between the main walkway and the kerb. A minimum clearance of 0.6m from kerb to a parallel bicycle stand should be kept in mind. •	In cases of wider footpaths, clusters of bicycle parking may be oriented perpendicular to the kerb. ITDP India – Park It right! Reclaiming the street- green spaces on neighbourhood streets in place of parking in a neighbourhood in London, UK. Sadiq Nagar, New Delhi @Navanil C.
NEIGHBOURHOOD STREET- 6M WIDE A narrow neighbourhood lane with a width of 6m or less should have a predominantly pedestrian feel to it and be treated as shared surfaces. As per IRC guidelines its not mandatory to have footpath in a 6.0m street but these have to be designed to be the most ITC friendly spaces in ITCN. Therefore these must be treated as shared surfaces or woonerfs. These lanes are not suggested to have twoway traffic, as this reduces the space available for pedestrians to almost nothing, making it impossible to use by ITCs. One-way traffic should be allowed at a speed of 15kmph in these innermost streets of a neighbourhood. In this scale of neighbourhood streets cyclists, pedestrians, ITCs, differently abled people, all share the space with vehicles. The Woonerf concept is relevant for lanes smaller than 6m also, especially in dense neighbourhoods and inner city areas. NEIGHBOURHOOD STREET - 12M WIDE Wider neighbourhood streets connecting it to the city fabric need to have safe and continuous space for ITC movement. It may seem important to clear vehicular traffic on these roads quickly to avoid congestion that is why two-way movement can be accepted and designed for. But adequate traffic calming measures should be applied to make it safe for ITCs to move along these neighbourhood streets. A 12m wide neighbourhood street should ideally have a designated safe cycle/stroller lane as the traffic moves faster on this street. A very wider pedestrian zone may be made on one side of the street, which can accommodate play zones, resting zones and green. Alternatively, two footpaths, one on either side of the traffic lanes may be provided for. A 12m wide local road may also accommodate designated parking alongside the lanes. In such cases, the parking areas may be interrupted at places to create chicane areas at intervals along the street. Parking on both sides can only be accomodated by allowing one way traffic on these streets and by interrupting the parking at every 60m with pinchpoint table top crossings. •	Preferably used in areas which do not require on-street car parking. One Way Pinch Points •	One-way street with continuous parking on both sides; •	Footpaths on both sides, with 1.8m of clear walkway and planters at intervals; •	‘Pinch points’ at every 60m to create a safe crossing zone, a wider pavement area with an area for popup play zone, larger trees for shading and seating spaces; •	Table-top crossing point with strollerfriendly surface materials. Sadiq Nagar, New Delhi © Navanil C.
NEIGHBOURHOOD MAIN STREET - 15M (OR 18M) WIDE The main street is the primary access road within a neighbourhood and the main traffic thoroughfare. Main streets will often have two way traffic and may have continuous street parking on both sides of the road. But its neccessary to have continuous pavements on both sides of the street for ITC accessibility. It is advisable to create safe crossing points at regular intervals, where the parking zone is interrupted to create a wider pedestrian area that may be used for various activities. This should happen at every 60m maximum. This is the most effective two-way street cross section for dense neighbourhood’s main streets. •	Strongly advisable to create several pinch point safe crossing zones; •	The pinching allows a visual break in the parking, creates spaces for greenery and resting; •	The table top crossing acts as a traffic calming measure and is also a barrier free movement space for strollers. Natural Boundary The area or neighbourhood which needs to become a home zone shall have a natural boundary so that it is perceived as a clear zone by residents. The length of a single road shall not be more than 1000m for psychological reasons. Longer street lengths may discourage use of the home zone as intended. There shall be no segregation of vehicular traffic direction or space. No medians should be present. The entire zone is free for pedestrians to use so making a separate crossing is not required in this zone. Cars in home zone areas know their speed limits and the drivers need to drive cautiously themselves. The zone is a self regulating design intervention and therefore external regulation is not required. Home zone is a kerb less area and there are no level differences in the area, a pavement thus can not be defined. The entire zone is paved with single level material. One way is not forced upon a home zone as the vehicles are driving at slow speeds. The traffic gets automatically calmed and directions dont matter. Having a two way street may encourage the use of the zone, however slow. The entry of home zone need more than a signage to indicate to drivers that they are entering a special area. The entrance spaces can have art installations, table crossings or strong surface change for clear indication. 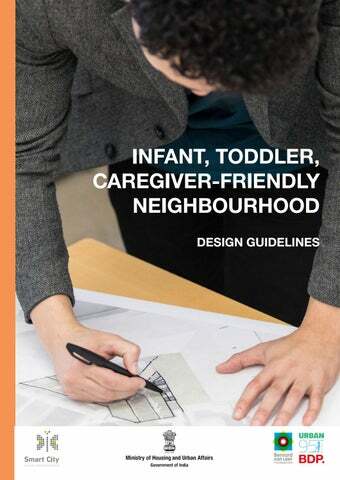 GUIDELINES FOR STREET COMPONENTS There are many elements that need to come together to make streets that are welcoming, safe and inclusive of young children and their caregivers. These have been sub-divided on the basis of the five objectives for a healthy ITC neighbourhood. contact with nature. Modern cities are full of dangers for young children and their caregivers. Therefore safety issues are to be considered and addressed when designing the public realm. Caregivers are less likely to send children on an isolated street. The presence of people and activity along a street acts as a means of passive control, and form the ‘eyes on street’13. Vandalism and crime incidents can be reduced by unofficial, passive control of the public realm. This is provided by residents or passersby having an unobstructed view of streets. If streets or seating areas are surrounded by buildings with windows looking onto them an active, open facades on the ground floors, then people feel safer. Beside including activity, the interface between the private domain of the home and the public street needs to be carefully managed. Currently, homes turn their backs towards the street at the ground level and residential streets are edged with high boundary walls. A porous and active residential edge should be promoted. Boundary walls should be avoided or kept at a low height. Guard cabins if any, should be in the private domain, looking outwards. Sitting at your doorstep, allowing children to play there allows community bonding and safer neighbourhood. Passive control is achieved by: •	Make sure that all corners of a street are visible from the surrounding buildings. •	Designing pedestrian routes along buildings that have open and active facades. •	Avoiding structures in the public realm that obstruct views. •	Introduce carefully placed neighbourhood amenities such as food vendors, local presswallahs. The following traffic protective measures could be implemented in a neighbourhood: •	Placing a low fence around neighbourhood areas where children go to, such as playgrounds, parks and informal play areas. •	Keeping parked cars at a distance from popular street crossing areas. •	Introduce traffic calming measures before street crossings •	Taking measures to prevent balls from going onto the street, like placing high fences around areas where ball games are played. •	Putting obstacles between the pavement area and the road to prevent vehicles from accidentally veering onto the pavement areas. •	Boulders or sturdy bollards along street edges for deterring cars. The spacing between bollards to be minimum 1.2m for single stroller to cross by. CROSSINGS ITCs are especially vulnerable at crossings because they move slower than adults or older children. In addition, the views of children in age group 0-5 can easily be blocked by low planting or parked cars. The interface between the road and the crossing needs to be considered. Navigating high curbs without curb-cuts is an obstacle for small children and also when with their caregivers in pushing a pram. Crossings by aProCH, Ahmedabad Consider involving children in designing crossings. This has been successfully implemented by aProCH, an organisation in Ahmedabad alongside Riverside School. Consider the following: •	Place crossings at regular intervals, to avoid ITCs having to walk extra to find a suitable crossing point •	If there is a median, create a large enough space on the median for caregiver and toddler to wait halfway as they may not be able to cross a wide street at once. •	Keep crossings clear of obstacles that obstruct the view. No parked cars close to crossings, no low planting close to crossings •	Major crossings to be visible by motorists. For example, with flashing lights. •	Where there are crossings with traffic lights, consider that these will have to allow for more time for caregivers and toddlers to cross safely. •	Brightly coloured zebra crossing markings make the crossing identifiable for small children. LIGHTING Good lighting plays a vital role in the perception of safety. Good lighting also prevents small children from tripping over obstacles lying on the pavement or uneven paving. Well-lit routes along streets will attract more people, be safer and allow for extended use of the street into the evening hours. Well-chosen light-poles and armatures can contribute to the character of a street and make them feel friendly. Take the following into account for a well-lit street: •	Choose a lighting type to reflect the use of the public realm being lit: High unadorned lights to shine onto road surfaces, and lower, attractive armatures to light footpaths and pavements. •	Add low-level lighting where the paving is uneven, or where there are steps to illuminate these obstacles better. •	Place lighting elements for pavement areas at frequent intervals. As a general rule of thumb, at least every 30m. •	No shadow zones or dark spots should be left while placing lighting along a foot path. •	Have a lighting expert calculate the level of lighting along the whole street. Ideally, the lighting level along the entire length of the pavement area should be constant at min.6-8 lux level. •	Avoid significant changes in lighting levels along a street. •	Consider the position lighting elements relative to the position of trees and other plants. Make sure that branches do not obstruct any light. •	Always keep in mind that, apart from safety, lighting can give added value to a place in many and creative ways. ITC WAYFINDING When small children walk in their neighbourhood with their caregivers, they gain important knowledge of the world around them. They also gain self-esteem and learn to explore. The urban environment in cities can be very hostile and bewildering for small children. The ability to use directions such as left and right does not fully develop until the age of 10 years.14 It is difficult if not impossible for children to move and explore independently, as they could get lost easily. Small children cannot read street names and so have to rely on other measures to show them the way. A good signing and wayfinding system designed especially for children will teach them to recognize where they are and show the route to familiar destinations. A wayfinding system designed for children prepares them for the next step in their development when they will step out into the world independently without their caregiver. When designing way finding for young children, consider the following: •	Place the system so that it is visible at an eye-level of 95cm. •	Use bright and recognizable features. Small children cannot read, clear symbols should be used instead. •	The use of (enhanced) existing landmarks can also work well for children wayfinding, while street art can further help children orient in the city. •	Easily recognizable objects, placed at regular intervals on the pavement, could be used to indicate routes. Or a signage system with symbols on boards can indicate the way. •	Map and incorporate the informal routes taken by children in the wayfinding system. GUIDELINES FOR STREET PLANTING Planting is important to create shade and cooling on streets. They create a pleasant environment (protection from glare and heat) In a retrofit context, there are opportunities to add green to the public realm which do not require much space, such as window boxes or climbing plants against facades, and arbors across small streets. These don’t require great amounts of time for maturation before healthy amounts of shade are provided. Consider the following: •	Use planting at different heightstrees for shading and lower plants at the scale of small children. •	Plants can be placed in various zones in the street: against facades, in a zone between traffic and pedestrians. If there is no space for planting on the pavement, consider planting between parked cars. Planting zones, if placed along facades, mitigate heat absorbed and radiated from the buildings (cooling factor). •	Where streets are very narrow like in inner city areas, consider using climbing plants against the facades. Place potted plants along a façade. However, ensure that there is still enough pavement width for a caregiver pushing a pram. Plants let small children come in contact with nature. •	Use indigenous plants and local species. Planting zones, if placed alongside roads act as a buffer between the street and the pavement, double up as protection. •	Try to retain existing trees when retrofitting a street. Large trees add instant character to a street. SHADING AND COOLING ELEMENTS A well-used street is a street that provides a comfortable environment to its users. In India, this often means protection from extreme heat during majority of the year. Providing shaded areas on pavements, creating canopies along well-used routes is crucial for small children and their minders. Resting and seating areas should be shaded from heat and rain for year round usage. Consider the following shading elements: •	Ideal shading is natural shading, where possible: use trees, bushes and climbers. •	Provide continuous shade on wellused neighbourhood routes. •	Besides built canopies, consider trellises overgrown with climbing plants. These provide shade while also having a cooling factor. •	Provide shaded spots where children and their caregivers need to wait: at bus stops, at busy traffic junctions and in play areas. •	Make sure that resting elements like benches, have shade. ACCESSIBLE STREETS As with a park or a small neighbourhood square, the pavement area can also be a place where people wish to linger and so make streets more livable and vibrant. To make streets accessible for ITCs, it is important to consider components such as ramps for strollers, low kerb-stones that allow a young child to climb up, ground cover, and safe resting equipment. INCLINATION RAMPS ITCs have special requirements in the public realm where level differences are concerned. A small level difference, such as a kerb of just 10cm high, is an obstacle for a small child and a pram. Kerbs should be inclined at all streetcrossings, to ensure a safe and easy crossing. Steps in the public realm could pose an insurmountable problem for a caregiver pushing a pram and a small child. Adding a ramp where there are larger level differences in the public sphere will ensure that all children, wheelchair-users and caregivers with buggies can have access to the full extent of the public realm. Consider the following when designing inclinations and ramps: •	Ramps with an incline of 1:20 (5%) to 1:15 (6.7%) is preferred for strollers.15 •	Flat 5-foot long plateaus shall be provided after every vertical 30 inches of elevation gain. 15 •	Ensure that the ramp is min. 1.8 m wide to accommodate an adult with a pram and a small child walking beside. •	In case bollards have to be added around the ramps, they should have 1.2m clear space between them. •	Provide a good handrail beside the ramp. Include a lower rail at the height of a small child. CONTINUOUS BORDERS Informal seating can be provided by structures along pavements areas such as built edges for planters or retaining walls where there are level differences. This generally provides long, continuous seating surfaces and could become small informal gathering spaces for a group of caregivers. Consider the following when designing planters or retaining walls: •	Build planters up to a suitable seating height; 400-500mm for adults and 200mm for toddlers •	Design the edges wide enough to double up as seating, altleast 450mm to 600 mm for laying babies down. •	Design the tops of the planters or retaining walls with a slight incline so rainwater runs off. •	Consider wooden slats or locally available durable material placed at intervals on low structures, to become informal benches. BENCH TYPES Resting equipment, particular along streets, provide the means for infants and toddlers and caregivers to spend more time outside. The possibility for a parent carrying his child of resting for a few minutes under a good shadow, while doing the groceries, can be a highly valued quality of the pavement area. Flip-down wall bench In areas where space is limited, for example, a narrow pavement, flip-down benches can be a space-efficient method to provide resting spaces. Wide bench for a crawling baby Where there is space, install extra wide benches. This provides caregivers with a place to safely set down a baby. Height-split bench Where there is extra space, benches can be height-split, to allow toddlers to climb onto them easily. This can be well combined with an extra-wide bench design. ‘Found’ or integrated elements for seating Seating should be integrated into public space as much as possible. It doesn’t have to be an installed bench as such. PLAYFUL FURNITURE Urban furniture in public spaces or primarily along streets, if well-chosen and placed, can become playful elements for toddlers and infants. The same applies to everyday objects like the border of a tree planter or number of steps, which can give new play experiences for the children. For example, a simple bus stop shading rail may double up as a place to put up a pop-up swing from for small children while waiting for the bus. For small children, simple, colourful benches can become exciting elements to climb, crawl, and have different playful experience. Think of the following when choosing outdoor furniture: •	Consider the street furniture through the eyes of a small child. Think of how they would perceive and use it. •	Choose low benches and seating with flat tops, so that children can use them with easily. •	Choose colourful street furniture. •	Choose edging along planters that railings that are low and wide enough for small feet. SIDEWALK GAMES Sidewalk games are an excellent example of how children can use their imagination to create a world of play within the boundaries of a pavement area. As a first step, designers need only provide children with an empty and protected space and some stimulating pointers, to fire the imagination and keep them reinventing and interested for hours. Sidewalk games can be stimulated by: •	Introducing patterned pavement over a small portion of the pavement area. •	Providing a smooth flat area of pavement, where children can draw their own pavement figures. •	Painting simple lines or squares onto pavement areas. •	Drawing the beginnings of a game or some shapes on the pavement for children to fill in. •	Using contextual games for easy and universal understanding. OUTDOOR SEATING Seating outside cafés often encroach onto pavement areas and can obstruct pathways. At the same time, they provide comfortable spaces outside to eat and protect clientele from sun, wind, rain or direct urban pollution. If designed well, terraces become pleasant places for caregivers and children to take a break and rest. They also provide a sheltered area where informal play outdoors can happen, under the supervision of their parents or caregivers. When designing outdoor seating, keep the following in mind: •	Leave at least 1.8m pavement space17 free of tables and chairs, to allow free movement of pedestrians walking past. •	Provide shading by using large umbrellas, trees, mobile canopies •	Provide shelter and protection by placing screens or planters along the edges of the terrace. POP-UP PLAYING Pop-up-playing is when a playing area with a temporary character is introduced into a neighbourhood in a place that is normally not used for play. This could be for a few hours, or a whole day. This offers small children the opportunity and space to play outside, close to the home that they would typically not have and also brings caregivers together, helping to build healthier and stronger societies. TEMPORARY STREET CLOSURE A neighbourhood street can temporarily be closed to vehicular traffic so that other streetactivities can be facilitated and explored. This can be an annual closure, for example, to facilitate a street party, but could also happen more often. For example, a neighbourhood street can be closed on a weekly or monthly basis, to give small children the opportunity and freedom to safely play on the streets while parents and caregivers can socialize. Quite often these closures are a test for the future and may lead to a permanent closure. Next to streets, public spaces like neighbourhood parks and playgrounds are important elements of daily urban life for ITCs. While streets are primarily used for movement and for connecting, the open spaces of the neighbourhoods are the destinations and used primarily for recreation. According to the present guidelines, the open spaces in a neighbourhood have been segregated into majorly three categories. Toddlers need a safe outdoor space for play. Babies and caregivers need fresh air and the stimulation of plants, trees, wind, and connection to the natural. Playing is a prime activity for small children. For the 0-5 age group especially, playing is a way to have fun, to socialize but also to learn. A big portion of this valuable playing time happens in designed playgrounds, where the playing environment is designed especially for playing. Small tot-lots, playgrounds in parks, squares or green areas, are all examples of designated play areas for children. If a city invests in better quality play areas for children, it also invests in creating better citizens for tomorrow. Outdoor play gives children physical exercise, closer contact with nature and a means of socializing with their peers. However, playing outdoors can also be dangerous and unhealthy, due to bad design choices and poor planning. But this should not be a reason for children to spend less time outdoors. This is all the more reason why designing play areas for children requires special consideration. HOUSING GARDENS/ NEIGHBOURHOOD PARKS Neighbourhood parks/Housing Area parks are the main recreation spaces for children in the age group of 3-5 and beyond. These parks serve in strengthening social ties in a neighbourhood and create more coherent societies. They can offer an excellent form of recreation and bring children closer to nature. POCKET GREENS In neighbourhoods where there is no space to add parks and public gardens due to lack of open space, some form of green can still be added in very small pockets. These small ‘pockets’ when viewed together, can make a visible different to the streetscape and soften the hard surfaces of the street. These ‘pockets’ can take on different forms, such as a green façade, small planters positioned in the pavement area or even turning a neglected car parking space into a greener area. Although individually small, together these pockets of green can have an impact and help to improve the air quality of a neighbourhood and contribute to the mitigation of the heat island effect of paved areas. This in turn will improve the environment for small children and their minders. Keep the following in mind: •	Have at least three different play objects in the tot-lot. •	Choose play objects specially designed for the youngest children. •	A low fence around a tot lot is sufficient to confine children to the tot-lot. Caregivers relax better if they do not have to keep a constant eye on the toddlers. •	Try to create tot lots where there are existing trees, or plant trees at the tot-lot. •	Place tot-lots along routes that are frequently used by ITCs. For example the route to the shops, or on the way to a health centre. •	Consider how caregivers will wait while the children are playing. Place a bench, or design a planter with a wide edge, or design a bench with the fence, etc. Urban Greening Guidleines - Page 7, suggests having a 125 Sqm tot-lot for every 2500 persons. USE OF SEMI-PRIVATE SPACES & URBAN LEFTOVERS In neighbourhoods one often comes across small underutilized spaces in the public realm. These are ‘left over’ spaces, unbuilt because they have an awkward shape, or not used for car parking because they do not have the correct dimensions. These areas may-be found next to building entrances, besides parking zones, or may be a forgotten and neglected pocket of green. Toddlers do not need large playgrounds, and it is often possible to transform these small ‘left-over’ spaces into a play area for children in the 0 – 5 age group. Scrutinize the neighbourhood for the following types of spaces to transform: •	Are there any underutilized areas in the neighbourhood, no matter how small? Covert them for positive utilisation. •	Are there any areas with forgotten parking spaces, that are seldom used? •	Are there any neglected planted areas, that could better be transformed into a small neighbourhood play area? •	Urban leftover spaces like - area under the metro/monorail line, odd shaped corner spaces, frontage zone of a semi-public building , area under flyovers/skywalks , lefover space in parking lots, space around neighbourhood shops, unused railway yards/lines, etc. can be converted into small yet usable open spaces for children. GUIDELINES FOR PARK AND OPEN SPACES There are many elements that need to come together to make open spaces that are welcoming, safe and inclusive of young children and their caregivers. These have been sub-divided on the basis of the five objectives for a healthy ITC neighbourhood. LEGIBILITY, SIGHTLINES & SIGNAGE The ‘eyes on the street’ approach towards planning parks is important. This ensures that parks and open spaces are overlooked by active facades and informal surveillance. In bigger parks, and those with a diverse landscape of trees, shrub thickets etc, it will be difficult to achieve natural surveillance everywhere. The layout of the park should then be clearly understandable to a first time user. •	Make sure that there are no solid walls, planting edges along main routes that obstruct sightlines •	Use sightlines to show a user what lays ahead and guide them to reach that destination. •	To make a sight line interesting, the designer can provide ‘an interesting object’ - a goal to navigate toward. It might be some feature or object that is striking or unusual, something to spark the navigator’s interest. Visibility and clear sightlines are an important factor in enhancing the perception of safety. Signage to guide the user to interesting destinations and activities is also important.The signage should be easy to maintain regularly and made from vandal resistant materials. •	Locate signage at key entry points and activity areas. Ensure that signage is positive, informational and well lit. •	Entrances and exits should be easy to locate for a first time user, and especially for ITCs. •	Have pathways connect with destinations, and well sign-posted. •	Locate active areas that there is clear visibility between them to encourage surveillance. LIGHTING Good lighting in a park provides a caregiver with a good overview of the situation by emphasizing paths, focal points, entrance and exits and gathering places. The space should be lit adequately (15-30 Lux), uniformly, with low light pollution and aesthetically. The lighting should be easy to maintain regularly and made from vandal resistant materials.22 Lighting systems can be coordinated to provide a sense of order and clarity in a park. •	attractive armatures to light footpaths and pavements. •	Place lighting elements for pavement areas at frequent intervals. As a general rule of thumb, at least every 20m with 20 lux level uniformly. 22 •	Consider the position lighting elements relative to the position of trees and other plants. Make sure that branches do not obstruct any light. •	Ensure that play areas are well lit. Also lighting levels should not cause excessive glare. •	Always keep in mind that, apart from safety, lighting can give added value to a place in many and creative ways. FENCING / PERMEABLE PERIMETER Fencing around a playground or play area is required for a variety of reasons. If the perimeter of the park is permeable and inviting from the street, people will be more inclined to enter it. Also fencing as a safety measure, will prevent children from accidentally running out onto oncoming traffic and wandering off. A fenced playground may be closed and locked at night, to deter, if not prevent vandalism. When designing fencing around play areas, keep the following in mind: •	Fencing does not necessarily mean using of actual fences. Depending on the needs of a public space, fencing can be achieved with the use of hedges or plants in general, other objects and street furniture or simple ground demarcation. •	Consider where most pedestrians will be coming from and how they will arrive at the playground. •	Position gates and entrances accordingly. •	Carefully consider how high the fence needs to be. A fence with the main purpose of keeping stray animals out or prevent small children from accidentally wandering off, can be kept low. A fence around a field where ball games are played needs to be extra high. •	Keep fencing permeable, with frequent openings every 50-80 metres. •	Make entrances welcoming and with large dimensions, min. 1.8 m wide. Caregivers carrying small children or pushing a pram need gates that are fairly wide to pass through. •	Consider the fence as an attractive object. It can add value to a space, by doubling up as a trellis plants, having benches incorporated in the fence, or having an attractive pattern. •	Fences can also be seen as a field for the development of creativity: other uses can be combined with fences like playing and climbing for children, or combined with street art. DESIGNING FOR PASSIVE SURVEILLANCE In parks and public places, installing a camera monitoring system should be a decision of absolute last resort. Studies show consistently that the presence of surveillance cameras has greater negative emotional impact on law abiding visitors, than they actually deter crime. Active parks, usable into the evening, where families are present at all hours, and activity is constant, is BY FAR the more effective way to limit crime and make visitors feel at ease. The way active parks are created comes down to simple design: making sure that people of all ages feel comfortable spending time in them. Great benches with well-designed views will make people want to go to the park. Design water fountains that are fun to play in, and build adventurous equipment that are stimulating to children of different ages. Build plenty of shade while maintaining clear sight lines, and make sure that seating, pathways, and fields if they are present are lit into the evening. Introduce programming into parks in the eveningsâ&#x20AC;&#x201D;even at tot-lots. This will further establish and send the message that this is a populated, family place, where criminals will not choose to visit. Parks without Borders, New York, USA New York has one of the most extensive neighborhood park systems in the US. With more than 5,000 individual properties comprising some 29,000 acres of land, the parks and playgrounds and community gardens add up to a significant share of the cityâ&#x20AC;&#x2122;s space. NYC Parks launched Parks Without Borders, a new program focusing on the corners, borders, and other underused spaces within (and around) New York parks. GREEN OPEN SPACES Increased contact with nature has benefits that impact the child’s overall development.23/24 Similarly for caregivers, access to a green space will have a direct bearing on their mental health.25 A study by Finnish researchers showed that even a ten minute visit to an urban park or woodland significantly improved stress indicators. Parks and open spaces should have a diverse landscape and varied vegetation, natural groundcover, shading and natural play materials. GREEN/ PLANTING Plants and trees provide shelter from the sun, mitigate the effects of heat stress and they clean the air. The Indian climate supports planting in urban areas. The challenge can be to find creative ways to incorporate more plants and trees in our cities and in an efficient way such that young children come into close contact with them while being safe from other dangers, so that they can explore freely. A concern to improve safety in parks can sometimes result in a sterile landscape, which will more likely result in less frequent use of the park. It is important that parks have a diverse and visually rich mix of landscape elements that are balanced throughout the various seasons. SHADING & COOLING ELEMENTS A well-used open space provides a comfortable environment year round to its users. In India, this often means protection from extreme heat for most parts of the year. A caregiver is less likely to bring a young child to a park, if he/she does not have a shaded and comfortable spot to rest whilst children play. Providing shade in outdoor play areas is crucial for small children and their minders. Shade structures can be provided over seating areas, protect playground equipment and allow visitors to spend more time at parks. Consider the following shading elements: •	Ideal shading is natural shading, where possible: use trees, bushes and climbers. •	Besides built canopies, consider trellises overgrown with climbing plants. These provide shade while also having a cooling factor. However, effective periodic maintenance of the same should be carried out. •	Provide shaded spots where caregivers need to wait and have good sightlines of play areas. NATURAL PLAY ELEMENTS Children have an unlimited imagination and they never miss a chance to use it, especially when they are playing. Apart from the pre-designed play devices that children love playing with, less defined objects offer countless possibilities of play. Natural playing objects are open ended materials. A stick can be used to darw patterns on the ground or become a boat in a puddle. “In this process of reinvention and assigning new meaning to objects, it is possible to mobilize skills related to divergent thinking, creativity, problem solving, among others.”27 Natural materials are eco-friendly, cheap, easyto-find and they can offer children a unique experience: to get contact with nature and the materialization natural objects have: textures, smells, properties and colours. Contact with such elements can also stimulate their learning ability in a very creative way, whilst also developing a sensibility towards nature from a young age. Think of the following: •	There is an abundance of such, simple, materials in low prices: water, sand, tree branches and trunks, stones and pebbles, different plants or insects and way more. •	Be sure that the used materials are clean and non-allergenic •	Keep in mind that natural materials are maintained under different conditions compared to artificial materials. •	Be sure of safety regulations. •	Some other common surface materials include: bark softfall, impact absorbing sand, Wet pour rubber, rubber tiles and pavers etc. ACCESSIBLE AND PLAYFUL OPEN SPACES Making sure that open spaces are accessible to infants, toddler and their caregivers needs to be given special concern. This includes measures such as age specific play equipment, resting facilities, inclination ramps for strollers and safety from stray animals. Similarly, playing facilities need to be age specific and allow adventurous and sensory play for a child’s overall development, accessible for all children, including those with disabilities. objects such as balance beams, vine walks, playhouses, treehouses, use of sound enabling objects can be considered. Another point to consider is to allow risk-taking opportunities in children’s play. Parent’s riskaverse approach towards play has resulted in boring playgrounds.28 Allow children to run around, climb, make and discover. The playpark is an adventure playground that consists of new topographies, and climbing structures designed around the theme of playing in and around trees. Low and wide bench in a park in West Delhi © Navanil C.
BENCH TYPES Well chosen and well design resting equipemnt can extend the time spent in a space. Resting equipment for caregivers needs to provide a comfortable space where they can sit and watch their children play. Also, parks are an ideal place for caregivers to meet other adults. Grouping benches together make it possible for relaxation and socialising. •	Position benches so that they give a clear view of the area where small children will be playing. Small children need more downtime than bigger children and would want to rest between playing. Consider benches that are low in height for toddlers to crawl onto, wide for a young child to lie down on and safe. Vandalised and broken furniture make a park or open space feel neglected. Choose robust, vandal proof furniture and furniture that is easy to maintain. •	Consider the material of the furniture. Concrete and steel benches absorb heat and can be uncomfortable to sit on in the summer. Wood stays cooler. Caregivers and small children spend longer time in a park than along a street. They may become thirsty or hungary. Consider where and how a drink or a snack may be eaten in the open space. •	Besides benches, consider how a drink or a snack can be given at the playground. Place an element with a flat top close to the benches. •	Place litterbins close to benches. •	Provide shade over benches. ENTRANCES & RAMPS FOR ITC Open spaces need to consider that young children, either independently or with their caregivers in strollers, have limited accessibility. Narrow entrances, a level difference such as a 10cm high kerb, steps are all obstacles for a small child and for a caregiver with a stroller. Consider the following: •	Entrances should have at least a clear 1.8m passage to allow a person with stroller move easily. •	Kerbs should be inclined wherever there is a designated entrance to the park to ensure a safe and easy access. •	Ramps are necessary where there are larger level differences from the access streets, to ensure easy passage for all children, wheelchairusers, caregivers with buggies •	The entrances should directly connect to a continuous dedicated stroller-friendly walkway inside the park. •	There should be a provision of widened openings at entrances for a group of 15-20 children to enter together, if required. PUBLIC ART There is a natural synergy between combining Public art with play spaces. Artwork can give identity to a playground, and make it a destination. Children naturally engage with art and works of art can stimulate young children’s imagination. Public art can be combined with play as an interactive element, or also as individual art works/elements integrated with the play spaces. Sometimes park spaces are fronted with dead walls, which could be an excellent canvas for young children to paint on, or engage. Or litter bins and toilet walls could be painted on. Engaging children and their caregivers in co-creating art can have a powerful impact. Consider the following: •	Think about what the artwork looks like, from a children’s eye level, 95 cm •	Depict scenes that relate to and interest small children, such as animals or everyday activities. •	Consider how children can learn through the artwork; add numbers to the work, use distinct shapes. •	Engage caregivers and children when designing street art. AMOUNT & COMBINATIONS OF USES/ACTIVITIES The design of a successful public space is more than just choosing play objects from a catalogue. Thinking how space will be used and designing the space to accommodate those uses, should be the main objective of designers. Children of different age groups will use neighbourhood play areas. Age-mixed play offers opportunities for learning as younger children learn more from older playmates than they could from playing with only their peers.31 Games and play objects should be chosen that serve the need of different age groups. How the space of a playground is allocated between different users should also be considered, as small children could interfere with the games and irritate older children. Only a good mix of activities and a careful allocation of the space can guarantee a successful public space, to be used by all. Consider the following when designing combinations of activates in playgrounds: •	Consider that children of different age groups will be using a playground. Choose play objects that suit the needs for a diverse age group. •	As a rule of thumb, at least three different play objects are required for each playground. •	Provide seating for caregivers that allow supervision, but is still far away enough for children to feel free. •	A cafeteria next to the play area is a positive addition and provides space for caregivers to relax and meet with other adults while also keeping an eye on the children. •	Design for flexible use: ensure that a part of a playground is also free of objects, leaving space for a ball game, skipping, hop-scotch, a picnic, etc. This will maximize the use of the space. TOILETS AND DRINKING WATER ITCs are especially vulnerable to the lack of toilet facilities in and around parks, where they spend a subsequent amount of their time in a day. Young children and toddlers frequently require fresh drinking water while they are engaged in high-energy activities in the park. And along with them, their caregivers as well. Thus, it is necessary to have fresh drinking water sources in all parks, which can also be independently accessed by children. •	Stroller-friendly walkway access to drinking water taps •	Maintenance of both these facilities is as important as installing them. Provision of toilets should only be undertaken if there is a clear programme for maintenance; otherwise the facility will seek to drive away people, rather than attract. •	Diaper changing areas with safe and clean platforms or mats should be made availabel along with toilets. REST STATIONS / NURSING BOOTHS Resting station or nursing booths / pods are an integral part of a child-friendly neighbourhood. Breastfeeding is associated with everything from better resistance to disease to the healthier bodyweight of the infant. With cities worldwide integrating lactation stations or booths in their neighbourhood design, it is necessary to keep in mind some of the most important aspects for booth setup. Hirkani Kaksh, Maharashtra, India The Maharashtra government is contemplating to implement the pilot project “Hirkani Kaksha”, started in Nashik a year ago, through primary health centers (PHCs) across the state to promote breast-feeding among lactating mothers. Consider the following : •	The space should be fitted with comfortable seats, washing facilities; •	The space should be homey and not shabbily put up; •	The space should be checked routinely for cleanliness; •	The room should be dimly lit and quiet; •	The access to the space should be stroller-friendly and the room should have sufficient area to accommodate a stroller; •	Availability of a change table or a diaper deck is necessary; •	Ideally, should overlook a tot-lot and clubbed with toilet facilities. •	Temporary structures or mobile structures can be used for placing these pods across ITCN. HOW TO APPROACH THE DESIGN OF PARKS AND OPEN SPACES Similar to streets, the components toolkit can be very useful when designing parks and open spaces. However, it is important to carefully consider the effect that a combination of the several tools will have. To illustrate the use of the components, examples of how they can be applied are given here. In the examples, the inter-relationship between the components become clearer and the relevance in the current urban scenario more meaningful. •	The distance covered by an ITC in within a certain timeframe is less than an adult would cover in the same time. •	Spaces need to be defined for different age groups. This ensures that the specific requirements of the younger / early childhood group are met.34 •	Parent and caregiver interaction space needs to be created to support communication and encourage contact between them. Social Infrastructure HOW TO APPROACH THE DESIGN OF PUBLIC AMENITIES Besides open spaces, children in a neighbourhood will also have other destinations that they go to on a regular basis. They may accompany their caregiver to the shops. They may make regular visits to day care centres and health centres. These public facilities need also to be designed with the needs of the young in mind. Every neighbourhood when planned by the city generally provides basic amenities as per the guidelines and norms set by the governance system. These are most of the time the ‘minimum’ possible solutions given. It’s important to note that amenities like daily shopping, health care, cultural facilities and utilities like toilets are the most frequented spaces in a neighbourhood. Therefore its necessary to design such spots to be ITC friendly. Young parents and caregivers generally perform these daily trips with little or no assistance. Access to these facilities and their design should consider ITCs as a target group. Public buildings could create and maintain porches in front of their entrances to offer caregivers some seating places. The added advantage of these areas is that they are shaded and under supervision, which makes them safe. These porches can be combined with other, interesting uses, like small food stalls, or game activities. Furthermore, stoops outside residential buildings can also offer resting possibilities to a passerby in a more informal context. Children need to have access to cultural facilities from the earliest age to maximize their development: music or theater help children to learn about the world while also recreating. Outdoor spaces, especially in countries with mild weather, which certain parts of India have, are ideal for implementing spaces specially designed to facilitate cultural activities. 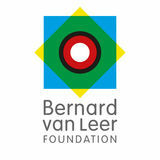 Consider the following: •	Work with administrators, school boards and authorities to have the school open during non-school hours for community physical activities; •	Send flyers home with students, post announcements in local newspapers, and alert the media to notify the community about school facility availability and upcoming programs; •	Make sure lighting, both natural and artificial are adequate, and that the school has ITC specific furniture; •	Dedicated play area for 0-3 years should be designed as part of the accessible opened school ground; •	Some of the indoor amenity/space can be converted into temporary lactation booths with appropriate safety measures; •	See page 21 on number and proximity of schools to be provided in a Greenfield development. DAY CARE CENTRES/ PLAY SCHOOLS Day Care Centres or Playschools for infants and toddlers should be well planned and offer a stimulating environment. They should create a sense of well-being and purpose for the caregivers, infants/toddlers and their families. Consider the following: •	Ceilings, walls and lights need to be pleasantly co-ordinated. Avoid bold colours, patterns, bare light bulbs. •	For infants; the areas for play, diapering, feeding and napping shall be set up to maximise contact between the caregiver and the infant. These areas shall allow the interaction to be unhurried and quiet. •	Play areas for mobile infants and toddlers shall be separate from those for non-mobile infants. They need sufficient uninterrupted space for exploration and discovery. •	The napping area shall be physically separate from other activity areas. Consider the following: •	There should be at least 2-3 dispensaries in a neighbourhood of population 15,000. These can be smaller in size but spread out so that most homes have access to them within a 5 to 10 minute walking time. •	There should be at least three anganwadis in a typical neighbourhood within 200 to 300 metres of most homes. These should ideally be located near a housing area park. •	Dedicated play area for 0-3 years •	Some of the indoor amenity/space can be converted into temporary lactation booths with appropriate safety measures. •	See page 21 on number and proximity of health facilities to be provided in a Greenfield development. VENDORS AND KIOSKS Apart from living in healthy cities, children and their caregivers need to have access to clean water and healthy food. Having food or vegetable shops close to every child is not always possible. One option to solve this is to the design specific spots within the neighbourhood where mobile food stalls can sell food without constructing other city facilities like car or pedestrian traffic. Food auto-vendors could also be used and positioned within public spaces. Inclusive Design for Street Vendors in India Guide by Centre for Urban Equity, CEPT University This is a very informative guide for detailed guidelines on incorporating food vendors and kiosks in the public realm. When designing food stalls, take the following into account: •	Vendors, kiosks and local service providers should not be placed to block the public realm. They should be placed within designated areas, leaving clear 1.8 m width of movement around them. •	Mobile food stalls can be designed to precisely fit the dimensions of a parking space, including the area needed for customers to stand. •	Other places for the stalls can be specially designed areas within public spaces, like parks or schools where people often come. •	Consider where possible locations for food auto-vendors could be within the public realm. Creative ways to combine vendors with playgrounds, schools, or recycle points are possible. •	Waiting spaces for caregivers should be present close to local vendors. CONVENIENT SHOPPING As part of neighbourhood public services, convenient shopping areas play an important part in an ITCN. They should be well designed and planned, keeping in mind the wellbeing of ITC. •	Stroller-friendly surface paving for the entire shopping area/plaza; •	Green interactive play zones should be designed; •	Natural shading; •	Continuous stroller path from the shopping plaza to the tot-lot park area forming an uninterrupted movement path for ITC; •	Well-lit throughout, making sure the area is accessible and safe for ITC after dark; •	Central resting place in the shopping plaza; •	Ramps connecting the shopping area surface level to the strollerpathway inside the park area; •	Vibrant colours for the shops, making it exciting for the kids; •	Side-walk play zones in the plaza; •	Integrating safe street crossing from the shopping zone. A PROGRAMME FOR PUBLIC ART Through public art, cities can empower citizens to contribute to the appearance of where they live. Public art can have an educational character, so children can learn by looking at it. There are major overlaps between public art and kinetic modes of learning in the design of public space. Public art can be as simple as painting a wall with the community. When it functions most effectively for ITCs is when the creation of playful images and sculptures in a neighbourhood are carried out as learning activities with children. These kinds of events are both stimulating for ITC brain and social development, but they also gel communities around ITC planning goals. Making art with children is a way of claiming space for them too, which can contribute to greater perception of safety of a place. It can also help to encourage a sense of ownership of public spaces, which means visitors can tend to clean up after themselves better and treat furniture and materials with more care. Finally, managers should consider commissioning professional artists to run workshops with neighbourhoods, and to contribute their own work as part of that effort. When considering public art in a neighbourhood, keep the following in mind: •	Use bright colours, that stimulate children •	Think about what the artwork looks like, from a children’s eye level •	Depict scenes that relate to and interest small children, such as animals or everyday activities. •	Consider how children can learn through the artwork; add numbers to the work, use distinct shapes. •	Engage caregivers and children in the process of co-creation. This will have significant benefits in connecting the community. PUBLIC TOILETS AND DRINKING WATER To extend the hours spent outdoors some basic facilities such as toilets are needed for both parents and young children. in cities. It is necessary to have fresh drinking water sources as a key public service, which can also be independently accessed by children. TRANSIT STOPS By locating childcare centres and preschools or other daily destinations within walking distance of transit stops may increase the likelihood of working parents utilizing transit while balancing the logistics of getting to daycare and work each day. Children often use transit to get to and from school and afterschool activities. Please consider the following while designing transit stops for ITCs: •	Stroller friendliness while using public transport is a little-discussed topic which needs as much attention as wheelchairs and bicycles. •	The height of the curb at a bus stop, a resting area near an auto rickshaw stand or a shaded corner while one waits for a bus/taxi/rickshaw can become the reasons for parents and caregivers to take or not take public transport with babies. •	Make sure transit stops are well shaded, have proper resting equipment and have clear sightlines for safety. Information display on availability of the next service is also useful for caregivers. Indicators 56. Presence of SWM collection facility and efficiency in the neighbourhood. 57. Household level coverage of SWM services through the door-to-door collection of waste. 58. Presence of SWM segregation facilities in the neighbourhood. 59. Efficiency in Redressal of customer complaints on SWM. 60. Quality of water supplied to a household in the neighbourhood. 61. Percentage of households with rainwater harvesting systems. 62. Percentage of parks, schools, and other public plots within the neighbourhood with rainwater harvesting systems. 63. Percentage of households with renewable source of energy like Solar/PNG, etc. 64. Percentage of public buildings and plots using solar / wind or non-carbon means (mapped). 65. Presence of solar lighting in and immediately surrounding parks. the groundwater and are a significant cause for air pollution.35 Of the waste produced, 40% is biodegradable, which if addressed at a neighbourhood level, can substantially reduce our dependency on land to dispose of waste.35 Utilities need both adequate provision, and constant management. Building trust is central both ways, both from the management system and also by the residents to use it properly. From the earliest stages of development, small children can be taught to contribute to keeping streets, parks and playgrounds tidy and free of waste, and contribute to economical use of resources. Not only it is necessary for our cities, but letting children learn about concepts of “Reduce, Re-use, Recycle” 36 at a young age is the best investment for the future of the cities. The 3 R’s apply to the management of waste, water and power. WATER COLLECTION MANAGEMENT Water management is a constant issue in cities, whether it is the conservation of water in dry areas or preventing flooding during the monsoons. Extreme weather events through climate change are exacerbating the problems of both drought and flooding in. On a neighbourhood level consider the following to improve the water collection in streets: •	Ensure that every neighbourhood has a good drainage system. In neighbourhoods it is important to have good drainage to prevent stagnant water and puddles from forming in the public realm where mosquitos can breed. •	Try to design natural drainage systems like raingardens, where possible. •	Make sure drains are kept clear of leaves and other debris and kept unblocked. Consider the following steps as part of a healthy and responsible waste management approach: •	Provide garbage bins beside benches, resting points and along frequently used pedestrian routes in the neighbourhood. •	Provide adequate garbage bins in play areas, parks, plazas and other areas where people gather. •	Choose garbage bins that children can also reach. •	Use symbols on garbage bins to indicate what type of garbage should be disposed of in different bins. •	Inform residents of a neighbourhood about the importance of proper waste disposal. Encourage residents to compost kitchen waste •	Organise collection of household compostable waste along with biodegradable waste in open areas for neighbourhood wide composting (local waste management plants). RENEWABLE SOURCES OF ENERGY The benefits from the use of renewable sources of energy in the design of child-friendly cities mostly fall under two main categories. The first one is the result of the actual need of energy in places where it cannot be found. Public space lighting, smart sensors and applications or cooling and shading systems can all be powered by RSE very easily and in a cost that keeps on reducing year after year, making renewable energy an affordable technology. Renewable sources of energy have been used in many projects around the world in a very successful way, especially in developing countries. Good examples can be found in the guide “Best practices compendium” of the current document. The second group of benefits for renewable sources of energy is a result of the educational role these sources can have, especially between young members of society. The environmental awareness RSE can raise is the most important investment for the future of a society with a huge impact on the children of the future. •	Promote the use of already available digital complaints boxes amongst a wide group of residents in the neighbourhood. The success of this app and other digital complaints box will be with adoption by a large number of residents. •	Set up Whatsapp or voice-based help-lines. •	Encourage residents to set up a digital bulletin board via Whatsapp groups or other platforms to discuss and address neighbourhood issues. •	Train civic officials in adopting such applications. Digital exposure for public officials is critical to the success of such platforms. •	Consider integration of digital dashboards across all utilities and public services in a neighbourhood - for example, a single app that allows residents to address issues with water supply, mosquito breeding, waste management, park mulch, community events, school availability, childcare facilities and so on.